Today was, in a word, terrifying. Everything was fine, I got up late, cycled for a while, had a shower and went to a work conference in Waterloo. Walking in, I remember thinking with a smile how I never thought I’d feel joy at bouts of nausea. I had a cup of chamomile tea, sat down to listen to the key note speakers and queued up for lunch with everyone else. It was when I went to the bathroom and noticed blood that the world started spinning and my nausea for once had a different cause. I immediately phoned the GP where I have an appointment next week, and told them I was bleeding. They offered me an on the day appointment, a rare feat in the UK! The afternoon session of this conference passed in a blur of welling up eyes and mounting terror. The doctor herself wasn’t really able to say or do much, but she gave me a note for an ultrasound at the Early Pregnancy Unit at Kings College Hospital where I then had to go to make an appointment for a scan. I decided to go straight over there (I realised upon arrival that I could actually see my lounge window from the window of the clinic). I gave the receptionist my letter and she referred me on to the nurse. I had no sooner sat down with the nurse than I started crying. I was just so scared. 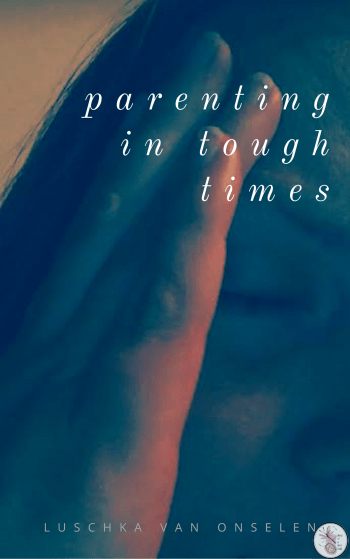 I know that miscarriages often happen in the first 12 weeks, and that until that time is up, there’s really no guarantee, but that did not make me feel any better. I know I’ve only known for sure about my baby for 3 days, but I am already so in love with this little being growing inside me. In fact, today I understand why it’s easier for doctors and the pro-choice groups to talk about the “fetus” and the “fetal sac” – because when it goes wrong, as it does so often it’s easier to deal with than a child dying. Anyway, at the clinic they were really great. The nurse, Pam, was so friendly and warm, that the tears that wouldn’t stop coming didn’t even feel embarrassing. She asked the gynecologist whether he would mind seeing one more person , which considering it was past five already was very kind of them. The gynea was great. He reassured me so much. He showed me my ovaries and told me it was the right ovary that produced the egg, he showed me the womb and then he showed me the tiny little button that is our baby. He told me to hold my breath and there I could see on the screen the white blip of my little baby’s heart. Wow. What a moment. At one point, he was reading out measurements to the nurse and he said the baby’s head to bottom measures .03 cm (the crown rump measurement) to which I commented “my baby has a bottom!” The doctor and nurse laughed at me, but I was just so in awe of this white blip that can change the life of two professional adults in such a profound way. 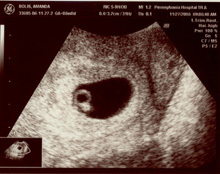 This little picture is not my scan, but the little white circle is exactly what mine looked like, my little baby at six weeks. Our Button is forming fingers and toes, retinas and ears, it has its own heartbeat and lives in a tiny little sac inside me. I was so scared today. There is still a 30% chance of miscarriage, but today, this moment, my little Button is healthy and fighting fit. Agh honey, dont put anything over your head, just keep healthy, eat well, rest LOTS and listen to your body. The days of you doing ANY manual labor is now over, no lifting heavy things (sez she who is lifting a 3yo still) but treat your body as the temple it is at the moment. 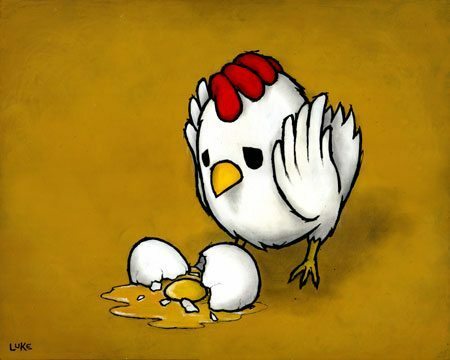 You are incubating a new life, treat your body with the respect that it deserves. If you have any questions or anything you want to know, you just give me a shout, I’m old hat at this already 😉 Your bean is beautiful, congrats again.